Planning a trip to Thailand but prefer not to spend too much time on the beach? 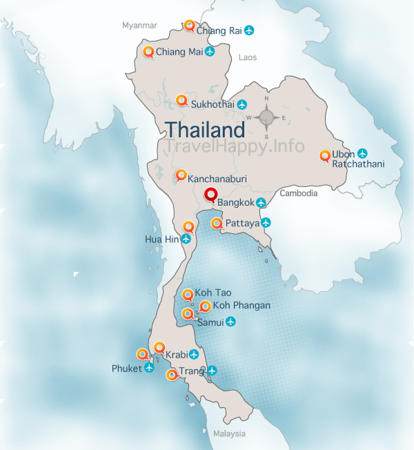 While Thailand is best known for its beautiful beaches, its capital city and mountain destinations are also great places to spend your holiday. From Bangkok’s bustling streets and huge shopping malls to the relaxing mountain scenery of small towns like Pai or Mae Hong Song, splitting your time between Thailand’s capital and its northern destinations is a great way to spend a week or more. If you prefer dense cityscapes and beautiful mountains to beach destinations like Phuket and Koh Samui, keep reading. We’ve prepared a one-week itinerary for Bangkok and Thailand’s best mountain destinations to help you get the most from your trip. Bangkok is a modern city, but it’s also full of interesting historical attractions. Spend your first day in the capital visiting temples and historical attractions like the Grand Palace and Wat Pho and enjoying great views over the Chao Phraya River. Most of Thailand’s temples have a dress code. Wear conservative clothing that covers your shoulders and knees, as well as closed shoes that cover your toes, to avoid having to rent clothes at the gate. Built during the 18th century, Bangkok’s Grand Palace is a massive complex made up of royal residences and temples. Wat Phra Kaew, the Temple of the Emerald Buddha, is one of the top attractions within the palace’s grounds. Entrance to the Grand Palace costs 500 baht. If you’re visiting outside the cool season, which lasts from November until February, it pays to arrive as early as possible (the palace opens at 8:30 every morning) to avoid the midday heat. Wat Pho, one of Bangkok’s most impressive temples, is a short walk from the Grand Palace in Rattanakosin. The temple contains a 160 ft statue of the reclining Buddha and is home to one of Thailand’s oldest massage schools. 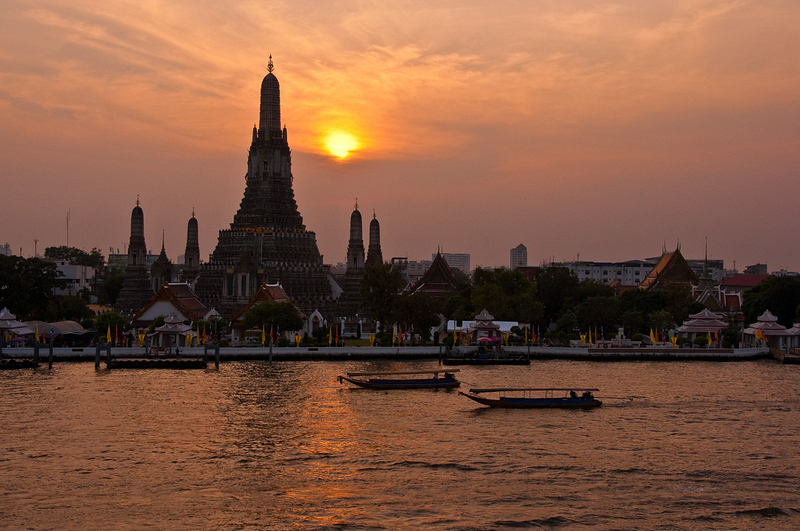 Located across the river from Wat Pho and the Grand Palace, Wat Arun is 17th century temple that overlooks the Chao Phraya River. Take the ferry from Tha Tien Pier, located a short walk from Wat Pho, to get to the temple. Entry is 50 baht per person. Luxurious riverside boutique hotel Sala Rattanakosin has a great restaurant that overlooks the Chao Phraya River and Wat Arun. If you’d like a nice lunch after visiting the Grand Palace and other nearby attractions, drop in before 4:30 pm for a meal. Less upmarket than Sala Rattanakosin but with views that are every bit as good, The Deck is a Thai restaurant located on the top floors of Arun Residence. The restaurant serves high quality Thai food and cocktails with excellent views across the Chao Phraya to Wat Arun. Thip Samai Pad Thai — better known as Pad Thai Pratu Phi — is a famous Pad Thai restaurant a short walk from the Democracy Monument on Ratchadamnoen Road. The open air restaurant is a great introduction to Thai street food cooked the old-fashioned way on a charcoal fire. Bangkok is full of shopping malls, offering a great selection of shops and a cool, air conditioned escape from the hot weather. 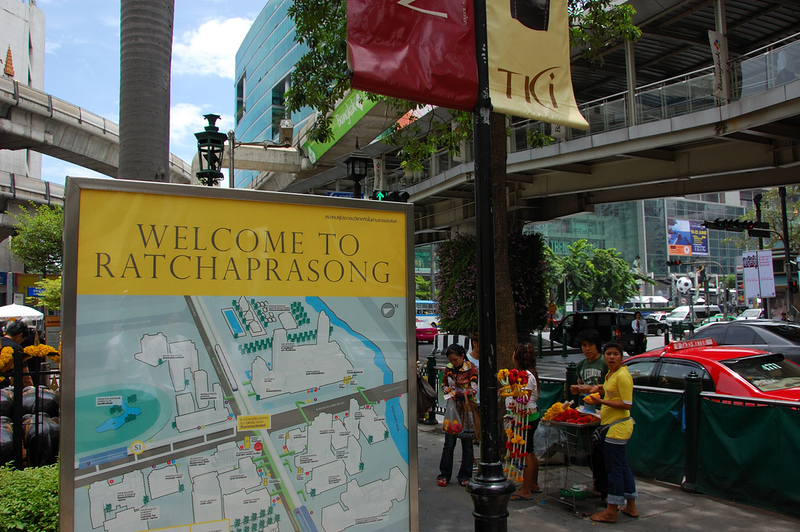 The city’s best shopping is found in Ratchaprasong, a central area that’s home to several of Bangkok’s largest and most popular malls. One of Bangkok’s most popular shopping malls, Siam Paragon is a huge shopping complex at BTS Siam. The lower floors are home to a selection of international brand name stores, with a food court on the ground floor and high street brands and technology on the upper floors. An indoor equivalent to the massive Chatuchak Weekend Market, MBK is a large shopping mall connected to BTS National Stadium that’s home to hundreds of independent vendors selling cell phones, inexpensive clothing and souvenirs. Bangkok’s biggest shopping mall, Central World is located between BTS Siam and Chit Lom. Its shops are mostly aimed at middle class shoppers, with a good range of high street clothing and electronics on offer. Central Embassy is one of the latest luxury malls to open in Bangkok, offering the typical brand name boutiques and expensive furniture shops. The upper floors contain a great choice of cafes and restaurants. A short walk from MBK, the Jim Thompson House is a beautiful traditional Thai house build in the late 1950s by American silk industry entrepreneur Jim Thompson. Guided tours of the house are available in several languages. The Erawan Shrine is a shrine to Brahma, a Hindu god known in Thailand as Phra Phrom. Easy to access from Central World or Siam Paragon via the Skywalk, the shrine is a great break from the area’s seemingly endless selection of shopping centres. Although Bangkok is a hot, bustling city during the daytime, many of its historical areas become a lot calmer after the sun sets. Grasshopper Adventures offers a Bangkok Night Bike Tour that travels past some of the city’s most iconic and beautiful markets and temples. Decades ago, klongs — the manmade waterways that run throughout Bangkok — were the city’s primary transportation system. The Small Teak Boat Canal Adventure takes visitors across the river to Thonburi, Bangkok’s sleepier half, for a unique tour of the city’s historical waterways. 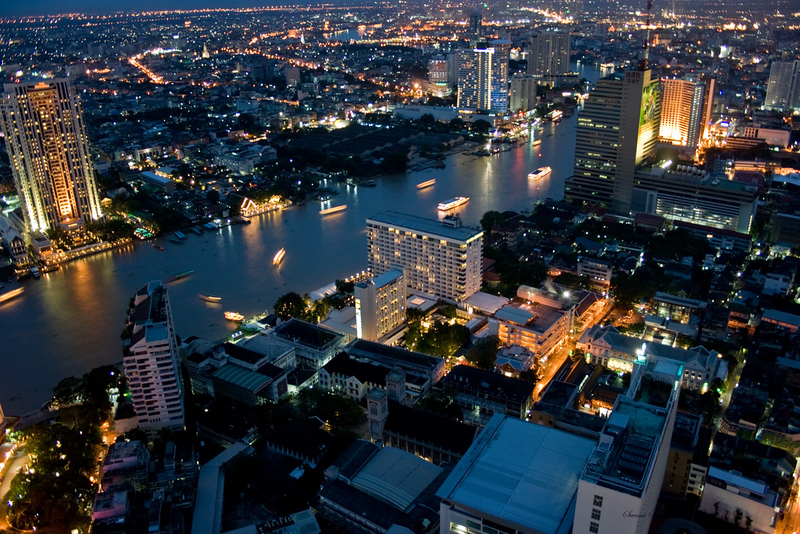 Bangkok has a large Chinese population, and the city’s Chinatown is one of the most impressive in Asia. Visit Chinatown’s bustling street markets for a look at commerce in this historical part of Bangkok and a taste of great street food, or alternatively try the food market on Silom Soi 20. 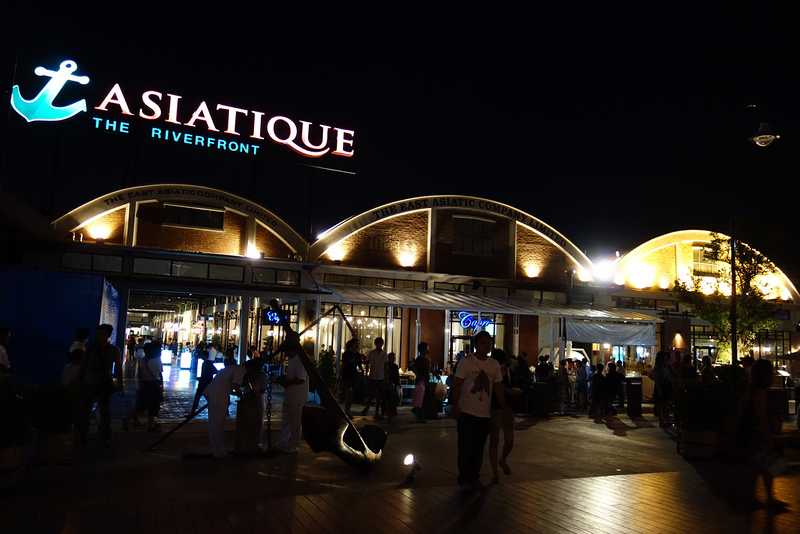 Asiatique The Riverfront is a huge outdoor market, carnival ground and public space beside the Chao Phraya River. The market’s 1,500 stalls sell a great range of clothes, souvenirs and other items, while cabaret shows and a Ferris wheel make the area a fun place to spend the evening. Read on to decide which of these cities and towns are best for you to take the high road. Chiang Mai is the gateway to northern Thailand — a charming city with a quieter, more relaxing atmosphere than bustling Bangkok. Before you travel onwards to Pai, Mae Hong Son or Chiang Rai, spend a night or two in Chiang Mai to experience city life in Thailand outside of Bangkok. 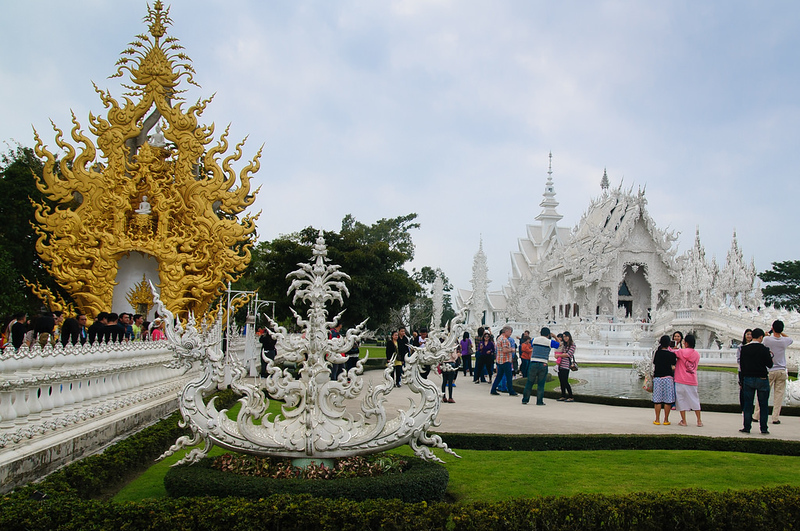 Read our quick guide to Chiang Mai. An icon of Chiang Mai, Wat Phrathat Doi Suthep is a mountaintop Buddhist temple located near the summit of Doi Suthep. 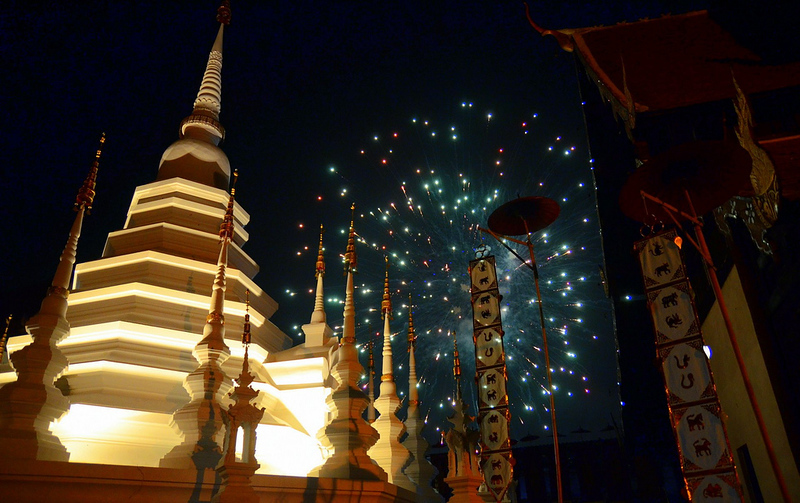 The beautiful 14th century temple offers great views over Chiang Mai and the surrounding area. Although Chiang Mai Night Bazaar is more of a tourist attraction than a cultural hotspot or real market, it’s a fun place to spend the evening. The market stalls sell the typical range of clothes and souvenirs — be prepared to negotiate if you’re searching for a good deal. Thailand’s tallest mountain, Doi Inthanon offers great views over the beautiful scenery of north Thailand. The mountain itself is a two-hour drive from Chiang Mai, making it a fun day trip for visitors that aren’t travelling onwards to Pai, Mae Hong Son or other mountain destinations. Located beside the Ping River, Anantara Chiang Mai Resort and Spa has a massive range of high-end rooms and suites. The hotel’s large grounds include a swimming pool, spa and health club. The Golden Bell Hotel is a convenient and clean three-star hotel located close to the centre of Chiang Mai. Although the hotel is outside the Old City gates, it’s conveniently located close to many of Chiang Mai’s most popular temples and historical attractions. Sleep Guesthouse is a cheap guesthouse located in Chiang Mai’s Old City. Despite the modest prices, the rooms and common areas are clean and modern, with a selection of double and twin guest rooms available. One of northern Thailand’s most popular small towns, Pai is a beautiful mountain town located just 80 miles from Chiang Mai. Despite the short distance, the winding mountain road that goes from Chiang Mai to Pai means the journey can take three to four hours. The quickest way to get to Pai from Chiang Mai is to fly via Kan Airlines. Flights depart daily and arrive at the tiny Pai Airport, completing the trip in just under half an hour. Surrounded by mountains and dense forest, Pai is best known for its beautiful scenery and wide range of outdoor activities. Elephant trekking, rafting, waterfall hikes and other fun activities are all possible from Pai throughout most of the year. Pai’s unique atmosphere — the town attracts a mix of Thais on holiday and backpackers — gives it something for everyone. From romantic holidays to adventure, Pai’s great selection of holiday activities make it a great place to spend three or four days. Located a short distance from Pai itself and easily accessible on a rental motorbike, Pai Canyon offers great views of the surrounding countryside. The canyon has several trails with steep cliffs on either side — wear a comfortable pair of sports shoes if you intend on looking around. Wat Phra That Mae Yen is a Buddhist temple with excellent views over Pai. Known in English as the Temple on the Hill, access to Wat Phra That Mae Yen requires walking up almost 300 steps to reach the temple. There are several waterfalls located around Pai, with Pam Bok one of the easiest to access on foot. The waterfall, which is a short hike from the access road, has a small pool that’s ideal for taking a dip after the hot walk there. One of several upmarket resorts that have opened in Pai recently, Reverie Siam Resort offers great views over the lush countryside that surrounds Pai. Although the resort is quite far from Pai’s centre, it’s easy to get into the town on a rental motorbike. With a location close to Pai Airport, Kirina Retro House is a quiet three-star hotel with fun retro bear themed decorations. Choose from a variety of rooms decorated with murals of cute cartoon bears impersonating Jimi Hendrix, crossing Abbey Road or playing the ukulele on the beach. Pairadise is an inexpensive resort with a selection of simple bungalows located within walking distance of Pai’s town centre. Air conditioned and fan cooled bungalows are available at great prices, making Pairadise Guesthouse a good choice for budget travellers. Quieter and more isolated than nearby Pai, Mae Hong Son is a small town located close to the Thailand/Myanmar border. Surrounded by mountains, Mae Hong Son is a relaxing destination that offers a great look into life in rural northern Thailand. Mae Hong Son’s centrepiece its lake, which is surrounded by temples and a good selection of upmarket restaurants. Wat Doi Kong Mu, which overlooks the town, offers incredible views of the densely forested countryside. Like Pai, Mae Hong Son’s isolated location in the mountains makes it hard to access by bus or minivan. Flights are available from Chiang Mai on Kan Air, which complete the journey in about 35 minutes. More adventurous travellers with experience riding a motorcycle or driving in the mountains can travel to Mae Hong Son by road from Chiang Mai. The Mae Hong Son Loop, which connects the two towns with Chiang Mai, is famous for its panoramic views and hundreds of curves. Wat Doi Kong Mu is a beautiful hilltop temple located to the west of Mae Hong Son town. The temple offers incredible views over the city and its surroundings, making it a great first place to visit to get a feel for the Mae Hong Son region. This impressive bamboo bridge connects the town of Kung Mai Sak with a local temple through rice fields. The views over the rice paddies are incredible — visit before sunset to enjoy a great look at the Mae Hong Son countryside. The visual centrepiece of Mae Hong Son, Chong Kham Lake is a popular meeting point for people that live in Mae Hong Son. The lake is surrounded by several picturesque temples, as well as a selection of restaurants and cafés. 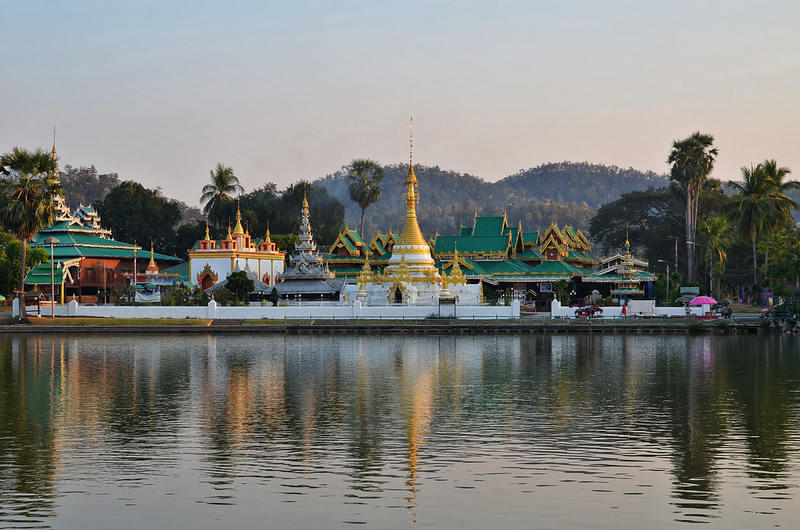 Located beside Chong Kham Lake, Wat Chong Kham is one of two temples that overlook Mae Hong Son’s centre. Wat Chong Klang, which is located inside the same grounds, has a unique white and gold chedi that contrasts with the larger Chong Kham Temple. A large four-star hotel located just outside Mae Hong Son, the Imperial Mae Hong Son Resort is a comfortable, convenient accommodation option. The hotel’s large outdoor swimming pool and fitness centre make it a great choice for visitors that want to relax. Fern Resort is a quiet mid-range resort located outside Mae Hong Son. The resort’s cottages are situated in an open garden area, giving it a relaxing atmosphere that showcases some of the region’s scenery. A short walk from Chong Kham Lake, Boondee House is an inexpensive guesthouse that has a good selection of clean, cheap and simple rooms. All of the guesthouse’s rooms are equipped with free Wi-Fi. Three hours from Chiang Mai by bus, Chiang Rai is one of Thailand’s easiest mountain cities to access. 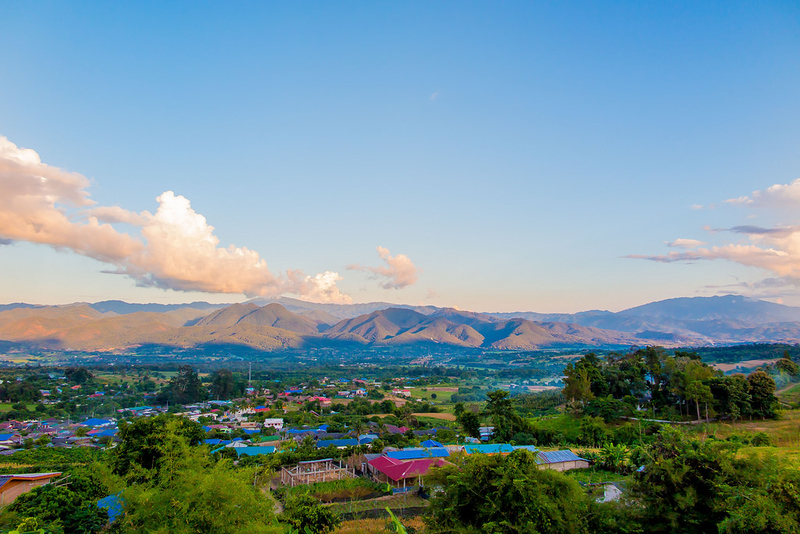 With a population of 200,000, Chiang Rai is significantly larger than Pai and Mae Hong Son but also provides great access to northern Thailand’s mountains. Surrounded by mountains and dense forest, Chiang Rai is a relaxing small city that’s Thailand’s northernmost centre. The city is famous for its excellent trekking, with a huge range of mountain treks to hill tribe villages available from the city. Chiang Rai’s beautiful temples and wide range of other tourist activities, from elephant trekking to bamboo rafting, add to its appeal and make it one of northern Thailand’s best destinations for families. Although the goods on sale are far from unique and easy to find at other markets, Chiang Rai Night Bazaar is a fun attraction that’s a short walk from the city’s bus station. 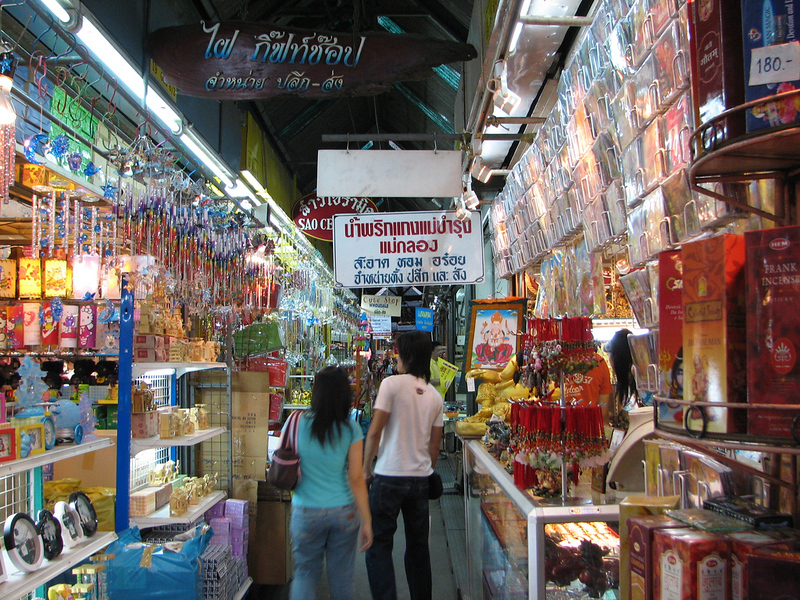 Lanna souvenirs and cheap trinkets make this market a fun place to stock up on gifts for friends and family. Privately built in 1997 as a historical art exhibition, Wat Rong Khun is a modern reconstruction of the historical Wat Rong Khun temple. The temple is an incredible sight, with a level of detail that’s unseen elsewhere in the region. Located 15 minutes from the centre of Chiang Rai on the Kok River, Le Meridien Chiang Rai Resort is a five-star resort hotel with a selection of upmarket rooms and suites. The hotel has extensive grounds and a three-tier infinity pool. Le Patta Chiang Rai is a modern four-star hotel located close to the city centre. A short walk from the Night Bazaar, Le Patta offers a good selection of clean and comfortable rooms along with an outdoor swimming pool and small fitness centre. With just nine rooms, Happynest Hostel is a small backpacker hostel located very close to the centre of Chiang Rai. Dorms and private rooms are available at low rates, making this a great choice for backpackers in need of a central accommodation option at a low cost.